Photo:The Church of Saint George, Lalibela and a panel painting inside depicting Saint George slaying a dragon; it is one of eleven monumental rock-hewn churches built in Lalibela, Ethiopia, allegedly under Zagwe-dynasty ruler Gebre Mesqel Lalibela (r. 1185–1221), while archaeology reveals the religious structures to have been built between the 10th and early 13th centuries. 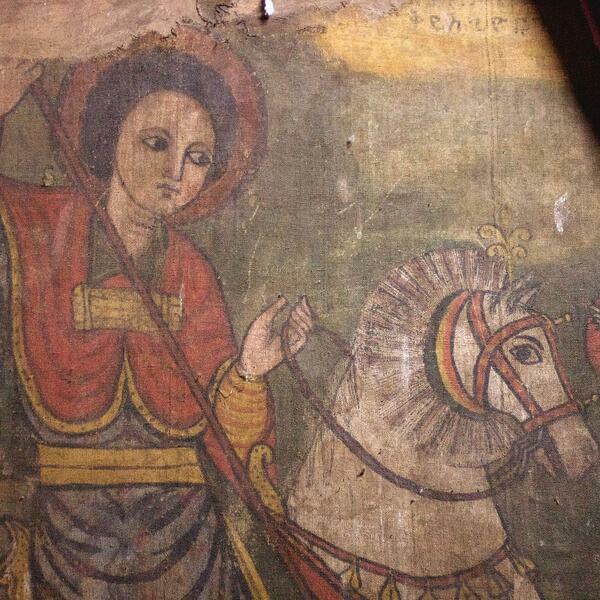 EDIT: the church paintings of Lalibela date to the 12th-13th century AD. See the following source: Teferi, Dawit (2015) , "A Short History of Ethiopian Church Art", in Briggs, Philip, Ethiopia, Chalfont St Peter: Bradt Travel Guides, p. 242, ISBN 978-1-84162-922-3. This is just part of a panel depicting St. George slaying the dragon. This photo focuses on St. George, his perky horse, and his lance. Can you guess what's in the next photo? Because St. George is Ethiopia's patron saint, paintings depicting this story are found in most Ethiopian Christian Orthodox churches. However, this painting is perhaps more significant than others of its kind because of its location in Lalibela's Church of Bet Giorgis, whch is dedicated to St. George. There's a bit more to the story than that, but it will have to wait until I post photos of the church's magnificent and iconic exterior. To my untutored eye, this painting looks quite old. It is less elaborately rendered than the paintings in the churches and monasteries at Lake Tana, which I believe date to the 18th century. I'm not sure what to do with that information. A simpler style could mean the painting is older than the ones at Lake Tana. Conversely, the coarser style could mean the piece was executed after Ethiopian religious art reached its zenith at Lake Tana (a proposition I've more or less made up on the spot). Since this painting is at Lalibela, which predates the churches and monasteries at Lake Tana by centuries, I will speculate this painting is earlier than the 18th century. But, bearing in mind that the Ethiopian empire's fortunes and territorial holdings ebbed and waned frequently over the centuries, with incursions from hostile forces, including Islamic armies, I'm the last person who'd know whether any given painting in a church in Lalibela has been there for 700 years or 70. If any flickerites can offer more information about this painting, including its age and provenance, I'd be grateful.